Inverness pilot Donnie MacDonald and co-driver Jamie Edwards took a mightily close second spot with Bruce McCombie (Banchory) grabbing a well earned final podium position in his ageing Mitsubishi Evo IX with Michael Coutts alongside. A new format would greet some 60 competitors who made the trip to Argyll and Bute to contest round four of the ARR Craib MSA Scottish Rally Championship. With two-wheel-drive crews running first on the road, the overall victors would endure very different conditions to what they are used to and a big crowd assembled at Dunoon Pier on Saturday morning to watch the cars being flagged away from the start. Organised by Mull Car Club and promoted by Dunoon Presents and local businesses, eight stages and 45 miles of special stages would lie ahead for assembled crews who had travelled from across the UK to contest the rally. A loop of three stages in the Glenbranter area kicked off the event, with the Bishops Glen stage in Dunoon offering some great action for the thousands of spectators which lined the route to watch the action. Rally HQ, event service and the ceremonial finish would all be housed at Dunoon Stadium during the weekend. 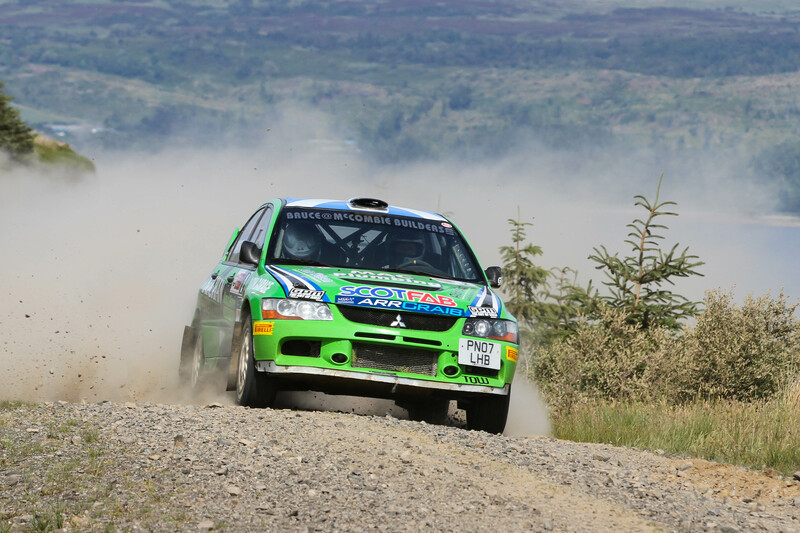 First of the high-profile crews to depart from the fray were pre-event favourites Jock Armstrong (Castle Douglas) and Cammy Fair who failed to emerge from stage one after an off in their Subaru Impreza. This left Fiesta R5 driver Rory Young to take the lead of the rally after the opening test. 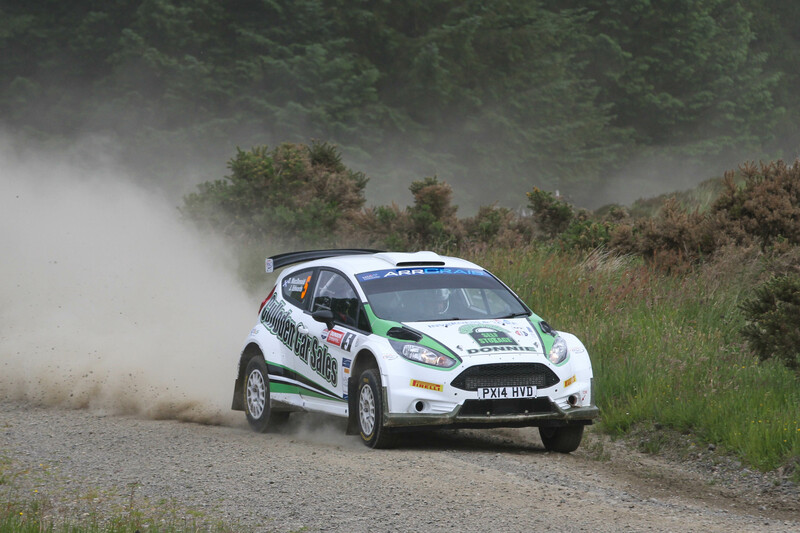 However, Young’s rally, like fellow Fiesta driver Mark McCulloch’s, would end on a tricky stage three leaving MacDonald and Gallacher to embark on an intense battle throughout the day for the top step of the podium. Gallacher (Hurlford) took advantage of the misfortunes of several front-runners during the opening loop of stages to lead the event at the halfway point, before a nip-and-tuck battle developed between him and Ford Fiesta R5 pilot Donnie MacDonald (Inverness). MacDonald and co-driver Jamie Edwards fought tirelessly throughout the day, but a stall and a puncture hampered progress. That would leave Gallacher to keep his nose clean and take a well-deserved Argyll Rally win, ensuring the Scottish Championship title chase remains wide open into the summer break. “It was a real surprise to win here this weekend as the competition was so very strong but we just found a pace we were happy with and stuck to it” said Gallacher at the finish podium. ”The stages were great and had a real mix, some tight and twisty technical stuff and some flat out driving. But you really had to be inch perfect most of the day as you have quite easily come unstuck. I struggled to find my way on the first loop but we got it together and grabbed the win”. McCombie was delighted with third overall, his first podium in well over a year but he would have to work hard for it. Such was the closeness of the day, Fred Milne and Abi Laudon’s late entry earned them an equal fourth overall, tied on times with John Wink and John Forrest in their Hyundai i20 R5. Each crew narrowly missing out on a podium during the final loop of stages. Clerk of the course Chris Woodcock is overjoyed at the response from the weekend’s event. “I’ve talked to the crews at the finish and they are still buzzing from the rally today, each and every one of them have loved the stages” he said. “We tried a new format this year and have had a great mix of classic tests which echo back to the 70’s when they rallied here as well as some new ones and it really has been a great move. The drivers have had a real challenge this weekend, but they are also delighted with the hospitality from the town and residents too. I must say a huge thank you to Dunoon Presents for their support and of course the people of Dunoon. Hopefully next year we can bring even more competitors to the area to sample these amazing forests”.